Just yesterday, we shot a television advertisement where we featured newlyweds. Similarly, the challenge for us was how to portray these clichèd characters in a new way. Check it out below: we went for a wedding couple with a hipper style. Long hair, canvas shoes and a Vespa for him. A hiked up skirt and a tomboyish straddle on the bike for her. No guests throwing rice. No wedding cake. No white doves. One, you simply can't bore the consumer – you have to continually reinvent the product to keep it exciting. Two, a strategy is mandatory – you must plan to make it work. And three, creative execution is key – from the setting, to the music, to the script/conversation, to the costumes – everything must be perfect! 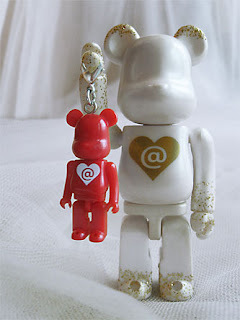 The 2006 Valentine Be@rbrick (top, right) is one of the few that come with a 50% size bear. The heart symbol on its chest has been modified to include an @ symbol. Why? Here's my take on it.